Illuminate your skin with the Nesti Dante Il Frutteto Red Grapes & Blueberry Soap, a vegetable-based cleansing bar. The renewing and energising properties of Red Grapes & Blueberry work to boost cellular renewal so that skin looks fresher and more luminous, while also offering antioxidant protection. The fresh and fruity scent makes for an incredible cleansing experience, and the vegetable base works to nourish the skin whilst gently ridding it of dirt and toxins. 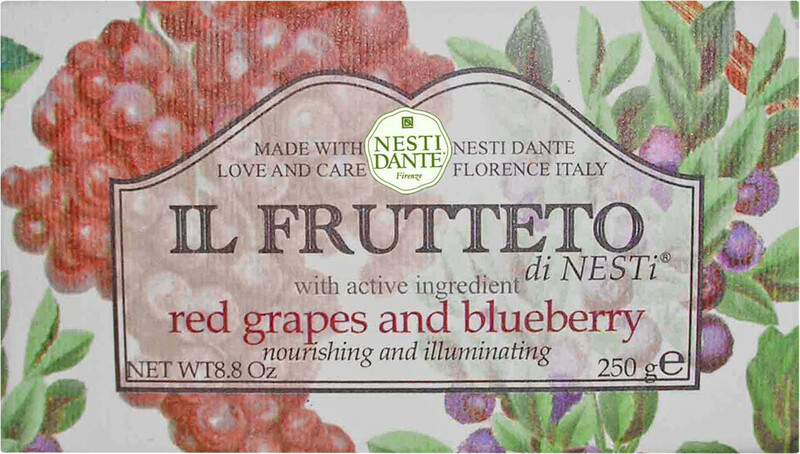 Nesti Dante Il Frutteto Red Grapes and Blueberry Soap 250g is rated 5.0 out of 5 by 3. Rated 5 out of 5 by CaroleJ from Best soaps Another delicious flavour from these long lasting soaps. Not overpowering just lovely. Rated 5 out of 5 by Plantie from A soap for everyone Lovely scent but not too overpowering, fine for both men and women (not too girlie! ).